What are Causes of Shoulder Pain? Pain is simply the stimulation of nerves fiber traveling to the brain; the brain is in charge of interpreting these sensations into the many forms of pain that we feel. 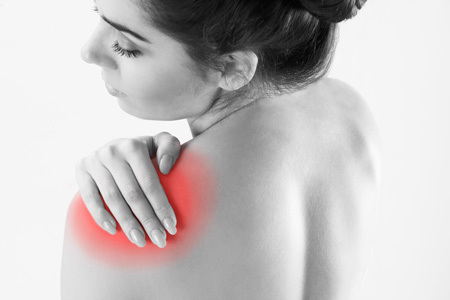 Shoulder pain is no different; it is caused by over-stressing structures of the shoulder (i.e. ligaments, tendons, muscles, cartilage, bone, fascia, and nerves), and improper motion. There are 3 bones, 2 joints, and 17 muscles that mainly contribute to the dynamics and motion of the shoulder. If the dynamics of the shoulder are out of balance, over time pain will occur. What are Symptoms of Shoulder Pain? Like all pain, these symptoms range in style and intensity. Pain may present as a sharp, stabbing sensation, shooting pain, or dull, achy pain. The duration can range from constant to occasional or intermittent and every frequency in between. Common symptoms include: stiffness, popping, clicking or swelling within the shoulder. There are many soft tissue attachments between the shoulder and neck so it is important to state that neck dysfunction or shoulder dysfunction can cause pain within either area. At ICT Muscle & Joint Clinic, we focus on treating the symptoms and root cause of your pain. The body is a dynamic, mobile structure and must be assessed and treated as such to create successful long-term outcomes. We employ the best scientific, evidence-based, treatment procedures by a combination of chiropractic, soft tissue therapy, and rehabilitative exercises. Surrounding all joints, there must be a balance between tension and compression of the ligaments, muscles, tendons, and fascia. When pain is present, it is due to an imbalance of these structures requiring mobilization and release of tight structures, in addition to strengthening weak or inhibited structures of the painful joint(s) as well as the joint(s) above and the joint(s) below. Shoulder pain and dysfunction is often the consequence of chronic scapulothoracic dysfunction presenting as acute pain. Our doctors’ focus on a comprehensive approach geared towards lasting results.